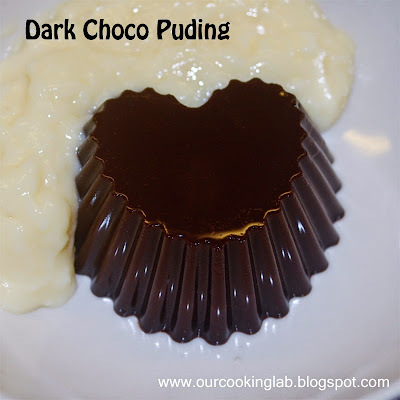 I love puding in any form or flavour. It's yummy and kills some guilty feeling in me that I've eaten some fibres after a meal. Indonesian version of puding are mostly made of agar powder instead of gelatin powder or sheet. It is very difficult to find agar powder in Munich. I bought one 2 sachets of agar powder at an indonesian store here. The transparent (written as white) color one costs around Euro 1,-. I was crying inside knowing that in Indonesia it costs much less than that. But the price was worthed, my husband love it and I love it too. Mix condensed milk, 600 ml of water, sugar, agar powder in a pot. Separately mix chocolate powder and coffee powder with 20 ml of hot water in a glass or a small bowl. just to make sure that the powder disolved in hot water and does not form lumps. Combine both mixture together and start to heat the pot with medium heat. 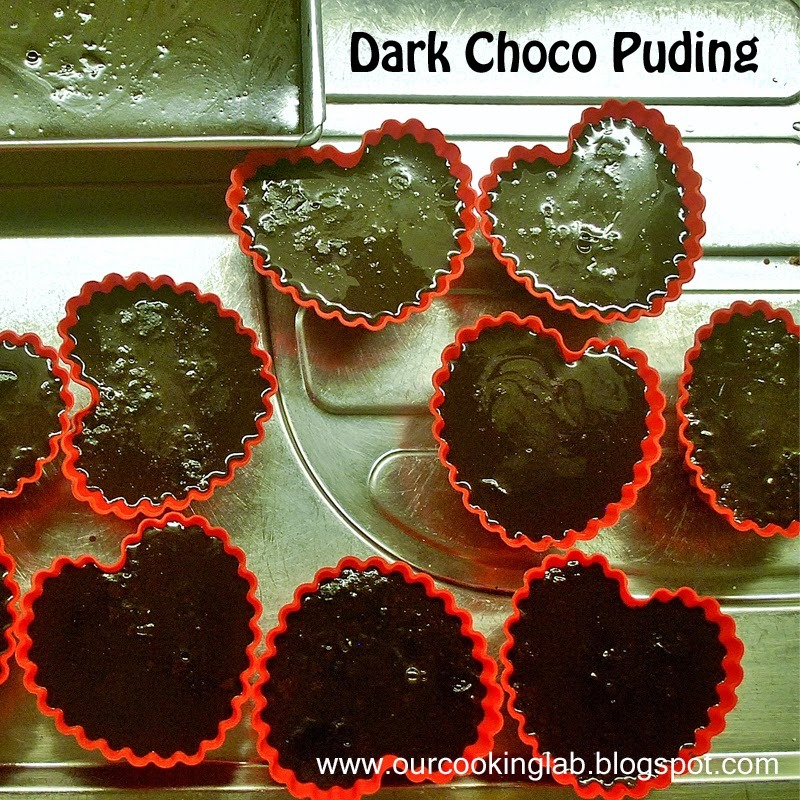 Keep stirring the puding mixture to avoid burnt at the bottom of pot. Bring the mixture to boil. When foams formed, remove the pot from heat. Turn off the heat and let it cool down for about 10 minutes before mold it into any form you have. In my case, I form it into heart shape silicon mould. While waiting for puding mixture to cool down, I prepare the fla. So far I'm still not satisfied with the consistency of my fla. 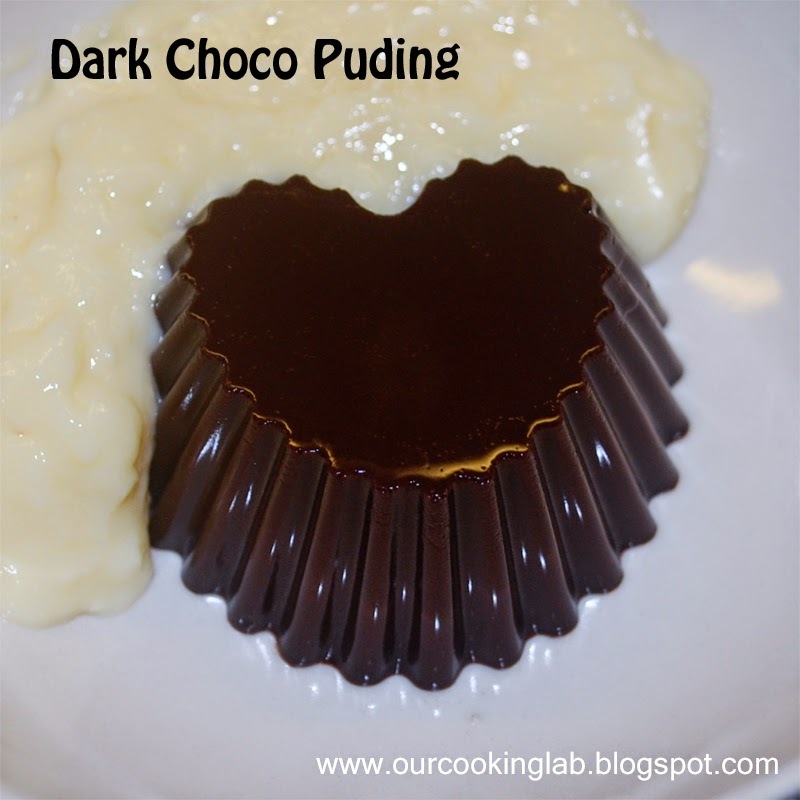 It is still too lumpy after cooling down, but taste wise it is a good compliment for dark chocolate puding chocolate puding. Mix all ingredients in a small pot. To avoid lumpiness mix egg yolks, flour, and tapioca powder separately. I used hand mixer and combine it together with milk and sugar. Bring the mixture to simmer (just before boiling point). keep stirring in this process. The last step it to add a few drops of rum in fla mixture and cool it down in fridge before serve it together with dark chocolate puding. If you do not drink alcohol, you may replace rum with vanilla essence. Amount of sugar can be adjusted according to your preference. I've tried the same recipes using indonesian version of agar powder (same brand: Swalow Globe) but the result was different. The puding was softer. I guess, we just need to adjust the amount of water.